Game may miss an opportunity to relate the impact of personal energy use choices on global environmental (focus is on financial cost to player). This piece should be added by the educator. 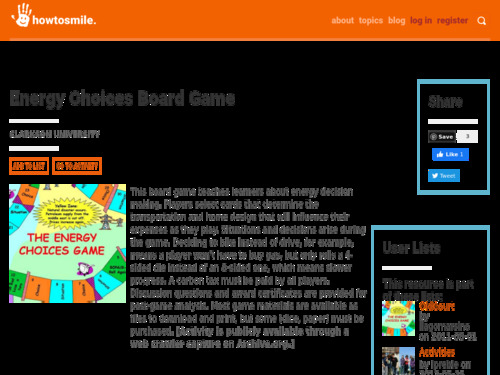 Well-designed game that makes relative energy use of household appliances, heating/cooling systems, and transportation choices easy to compare so players can weigh the impact of their choices as they play the game. Neither sources for the numbers that are used are cited nor mathematical equations given for how relative energy use of systems, appliances, and vehicles was determined. Educator should be prepared to answer these questions from students and might need to find this information elsewhere. Game is played in groups, allowing for group problem solving, strategizing, etc. Game structure provides for follow up discussions about energy choices. Great design design - very middle school oriented. Game and all instructions and materials are downloadable in pdf form from site. Needs prep time to cut out cards.